Swivelling Bath Seat No Step Over Required. 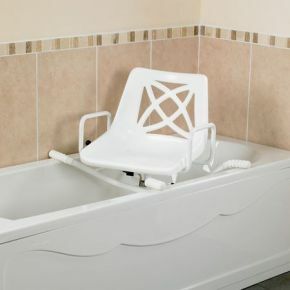 A swivel bath seat allows the user to sit down outside the bath, then rotate into position. They eliminate the need to step over the bath edge- a common sticking point and a common cause of bathroom slips and falls. The base is fixed, and the swivelling bath seat can be locked into four positions. Strong armrests offer support when sitting and rising. The base, swivel mechanism, and bath seat are made from plastic and steel that has been epoxy-coated for corrosion resistance. It's sturdy enough to suit users up to 19 stone in weight.